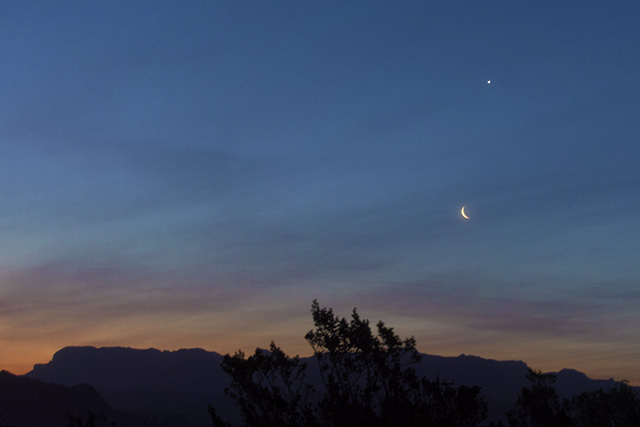 The Sun, Moon, and Venus rising over the Chisos (Ghost) mountains from Terlingua Texas. I'm staying in an old mining ruin, converted into a lovely guest house, in the Texas ghost town of Terlingua. I woke up early today and was greeted by this lovely sight. I postponed my shower, took a few stills, and set up a time lime lapse of the sunrise. I looked down and realized I had covered about 30 feet over sharp rock in my bare feet. I didn't notice on the way out, but was very happy to reach the patio after. Score one for the pocket astrophotography kit: Sony RX100 V, zoom 26mm, exposed 13 sec at f/2.8, ISO 125 on a Minox pocket tripod.